1. FC Köln will look to celebrate their recently-secured Bundesliga survival with a long-overdue win against FC Augsburg at the WWK ARENA on Friday evening (kick-off 20:30CEST/18:30GMT). 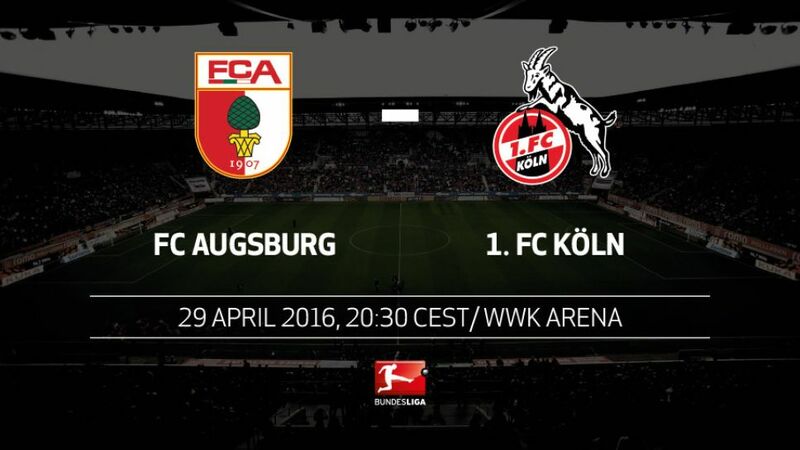 Augsburg come into this Matchday 32 clash in 12th, four points and places worse off than Köln in eighth. A win would see Markus Weinzierl's men guarantee their own top-flight status, and they have every reason to be optimistic: last Saturday's 2-0 win at VfL Wolfsburg means that FCA have taken nine points from their last three games, whilst it has been four-and-a-half years since the Billy Goats last beat Die Fuggerstädter. Peter Stöger's side are unlikely to let that get to them, though. Köln ensured they would see a third consecutive season in the Bundesliga in beating SV Darmstadt 98 4-1 last Saturday, and with Anthony Modeste having scored his first Bundesliga brace, the North Rhine-Westphalia club have a forward finding form at the business end of the season. Köln are guaranteed not to finish the season in the automatic relegation places after Saturday's win over Darmstadt. They took a game longer to achieve the same last season.The Billy Goats have won their last two, but have never managed three consecutive wins in the Bundesliga under Stöger.Augsburg are enjoying their own spike in form, having won their last three in the league. A fourth victory in a row would be a new club record in the Bundesliga.Alfred Finnbogason has opened the scoring for Augsburg in each of their last three games.In their last four head-to-heads, Köln have only mustered one point against Augsburg.Köln have not scored against Augsburg since December 2014, when Anthony Ujah - now of SV Werder Bremen - scored in a 2-1 loss.From the current squad, no Köln player has ever scored a Bundesliga goal against FCA.Modeste, with his brace against Darmstadt, has now scored 14 Bundesliga goals this campaign. That is the best-ever single-season return for a Frenchman in Germany's top flight.After five seasons in the Bundesliga, Augsburg need one more goal to reach to 200 mark.